It’s coming up to three years since we got married, and we’re yet to have a wedding album made, and until this week, my wedding gown was still hanging up in my wardrobe, complete with grass stains and drink spills. Life gets in the way, doesn’t it? But with two daughters I got thinking. What if they want to wear it? Or part of it? 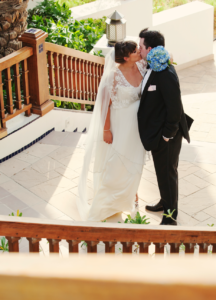 My wedding day was all about making memories – we didn’t realise at the time, we were just having fun – and we kept some souvenirs, but none as precious as my dress. It deserves to be preserved. As tempting as it was to take it to my local place near our neighbourhood mosque and pay AED35, I wanted the reassurance that she (my dress is definitely a she) was going to be in safe hands. Then a friend told me about Champion Cleaners, recommending their wedding gown service – and in my previous life I was a magazine editor as we did a ‘tried and tested’ dry cleaning feature when they came out on top, so I knew they were good. And could be trusted! They have a detailed and reassuringly lengthy process across all their branches – if it had been back in an hour I would have been suspicious! Fabric study and assessment as every wedding dress has different requirements, with experts doing a close inspection on stains, abrasions, discolouring and rips. Consultation to determine the best possible cleaning process for the material and construction of your dress, ensuring every bead, sequin and detail is cared for. An expert called me within a few hours of receiving my dress to say they could re-stitch a strap for me, which was a fab bonus. They also noted that a couple of pearls were missing, so I was aware of this before it was returned. Initial treatment to remove all spots and protect sensitive lace or beadwork prior to full gown cleaning. Silk, satin, cotton, rayon, linen, nylon, acetate, polyester, etc all have different fibre properties and react differently to the various cleaning methods and agents, so pre-treatment is essential. Champion Cleaners use the Green Earth and Allianz water fountain technology to achieve the best cleaning results in the mildest cleaning environments for wedding gowns. It’s all about using the most delicate products on your precious dress, with heavier stains treated with wet cleaning technology and even hand washing to minimise mechanical action. Gowns are then carefully inspected, with trims checked to make sure stitching is intact, and beads and sequins tested. It is then painstakingly steamed and pressed, using the right techniques for your dress, for example satin should be pressed on a dry cleaning hot heat, or hand ironed, and hemlines are rolled, not creased. Some wedding gowns require restoration if they are older or have yellowed. At this stage mild whitening might be used to get it back to its best. If, like mine, your dress needs minor alternations, this is when they happen, from fixing loose beads to fixing rip marks, all with your consent. Wedding gowns are then packed in a crisp white Champion Cleaners wedding gown box with a chest guard to safeguard the shape of the gown. Silica gel packets are added to the boxes to control moisture. My dress was beautifully packed out in the bodice to protect the bustline. How to book? My dress was picked up and delivered, I was kept informed of the progress, and it was back to me in three days. 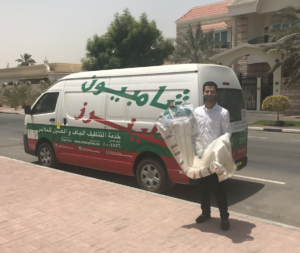 You can also drop off your gown at any of their 42 branches across the UAE. See http://www.champion-cleaners.com/ or call +971 4 2858581 for more information. Thank you to Champion Cleaners for treating my wedding dress for the purpose of this review.